Are you looking for bite-sized learning solutions that can help you get giant-sized training results? Do you want to help your learners access learning solutions at their moment of need? Do you want learning to be rolled out in small, standalone modules that build competencies block by block? 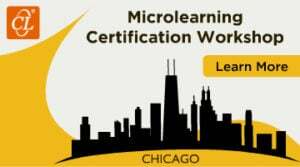 If your answer is yes to any or all of these questions, join us at the Microlearning Certification Workshop 2018, in Chicago on October 19. This interactive, intensive, hands-on seminar will equip you to understand why and how microlearning solutions can help you address the challenges of improving employee productivity and will help you get started with designing and developing effective microlearning modules with your own content. Do join us and discover how microlearning can be leveraged effectively to make your training initiatives a huge success. For details and to register, click here.